The Samsung Galaxy Premier has a long list of connectivity features. Let's start off with the basics - quad-band GSM/GPRS/EDGE and quad-band 3G (AWS is missing though). The 3G connectivity is backed by HSPA (21Mbps downlink, 5.76Mbps uplink). The Wi-Fi support covers a/b/g/n, with both 2.4GHz and 5GHz band compatibility. Wi-Fi Direct and DLNA are part of the package, of course. There's also Bluetooth 4.0 LE, which incorporates Bluetooth 3.0, but also includes the efficient Low Energy mode. It also supports the high-quality Apt-X audio codec. The Premier lets you share all sorts of media via NFC by simply touching the devices back-to-back. You'd need two S Beam-enabled devices to get this to work - while not many models support it, there are plenty of Galaxy S III's around. You can share with other NFC devices as well, but the functionality is limited to what is provided by Android Beam - Android's stock NFC tool. The AllShare functionality is now split into two: AllShare Play and AllShare Cast. The first is for transferring and sharing data and multimedia files to your notebook or PC. AllShare Cast on the other hand provides streaming content to and from different kind of devices (TV or computer) over DLNA. The MHL port has yet another feature - it enables USB On-The-Go. You'll need an adapter for that too (there isn't one in the box) but this one is fairly straight forward - you plug it into the Galaxy Premier and plug a standard USB cable on the other end. Just about every USB thumb drives and card reader we tried worked and reading all sorts of cards was problem-free - it even worked with a big CF card. Connecting phones worked pretty well too - we were able to access the memory of a Nokia 808 PureView we had laying around straight from the Galaxy Premier. 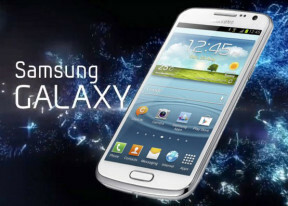 A new Android version always comes with an improved web browser and the Jelly Bean browser running on the Samsung Galaxy Premier is no exception. Samsung has put its own spin to it too. The browser supports both double tap and pinch zooming along with the two-finger tilt zoom. There are niceties such as text reflow, find on page, save for offline viewing, request desktop site and so on. A neat trick is to pinch zoom out beyond the minimum - that opens up the tabs view. You get five controls, but as you highlight one with your finger, it fans out into further options. Tabs, for example, bring out the tab switcher by default, but it also brings out options to open a new tab, a new incognito tab or close the current tab. Adobe do not officially support Flash on Jelly Bean, but you can side-load it if you like (1080p YouTube videos worked fine once we did). Still, you'd be better off sticking to the HTML5 versions of web sites - YouTube works and there are even a number of HTML5 games.